I have to admit I was a little wary of trying something that seemed to be geared towards dry skin. I have dry patches and my skin can look parched, but I have a much longer history of dealing with oil and acne. It honestly makes me a little fearful of trying new creams, due to the risk of breaking out and looking like a greaseball. However, I've had really good luck with the things I've been trying out, the HydraQuench products included. 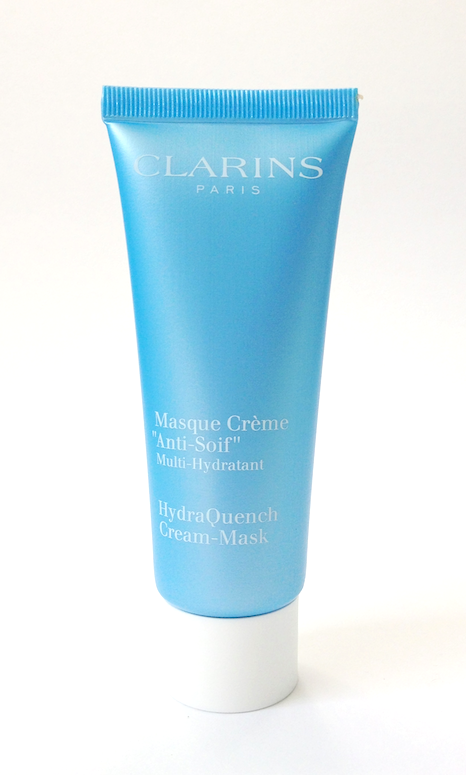 I first tried the Clarins HydraQuench Cream-Mask. Like all the items in this line, it hydrates the skin while helping to rebuild and protect the natural moisture barrier of the skin. This is not the type of mask that dries to a cracked-mud finish. It's a luxurious-feeling cream that can be applied anywhere you need a boost of hydration, and left on for 5 to 10 minutes. After that, it's supposed to be taken off with a toning lotion and cotton pads, but I preferred to rinse off the excess (what wasn't absorbed) with water. I was really surprised to see that there was no residue left on my skin - no oil, no stickiness. My skin looked refreshed and smooth, and the flakiness on my cheeks was attenuated. I have to wonder if very dry skin would actually find this moisturizing enough, because it felt so appropriate for my combination skin. Then again, maybe rinsing with water removed too much of the product that was supposed to be left behind? Regardless, it boosted the overall texture of my skin, but not in a way that felt like I had a applied a heavy cream. It also didn't, and has yet to, break me out. I feel like this is the kind of mask I could do on my cheeks once or twice a week, maybe more often during the winter months, to keep those areas in better balance with the rest of my face. This does contain katafray bark extract, glycerin and my beloved sodium hyaluronate, which will do the immediate job of attracting and retaining water molecules, and would probably be maximized by the subsequent application of a moisturizer. It also contains sorbier bud extract, which is supposed to aid in micro-circulation and presumably is partly what gives that "refreshed" look to the skin. The mask does tingle ever so slightly. 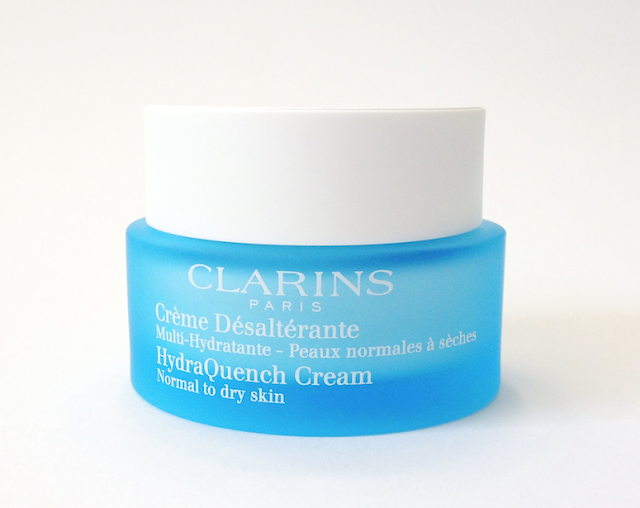 I also got to try the Clarins HydraQuench Cream. This is a glossy cream that also has an almost gel-like feel when rubbed in. I was very pleased (and surprised!) by how lightweight this felt on the skin, while still being quite hydrating. With heavier creams I usually mix them with a little floral water on the back of my hand before applying, in order to render them more texturally-appropriate for my skin. 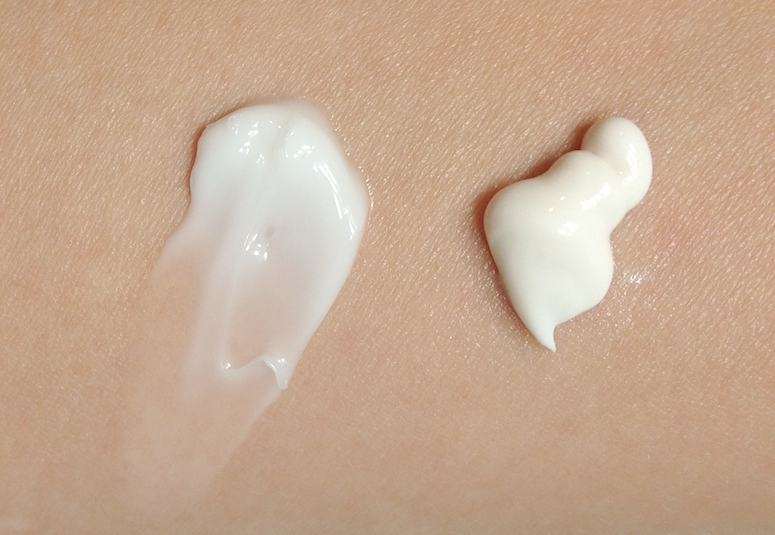 No need for that here - applied straight, the cream absorbed into my skin without leaving a trace behind. It also contains katafray and sorbier extracts, and hyaluronic acid, as well as pomegranate extract. I really, really liked the feel and performance of this. I was sure it would be too much for my skin, but it absorbed so well and kept my skin feeling smooth, plump and flake-free all day. Both of these are scented, which is part of the redesign on the line. Like the scent of most Clarins skincare, it's more complex than the usual masking fragrance. The top note is a green apple accord, with a middle note of rose and a woodsy base. It's really subtle and pretty and I love it, but if you have sensitive skin you may want to do a patch test first. These are some swatches to give you an idea of the textures. Availability: Available at The Bay, various Pharmarix/SDM and Murale locations, as well as Nordstrom. The mask is 36$ CAD/35$ USD, and the cream is 49.50$ CAD/USD.